the best-known of Hopper’s paintings, Nighthawks (1942), is one of his paintings of groups. It shows customers sitting at the counter of an all-nightdiner. Again, the shapes and diagonals are carefully constructed. The viewpoint is cinematic—from the sidewalk, as if the viewer were approaching the restaurant. The diner’s harsh electric light sets it apart from the dark night outside, enhancing the mood and subtle emotion. As in many Hopper paintings, the interaction is minimal, though the counterman seems to be having a few words with the man facing him. The restaurant depicted was inspired by one in Greenwich Village. Both Hopper and his wife posed for the figures, and Jo Hopper gave the painting its title. 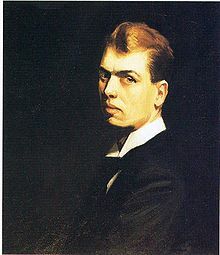 The inspiration for the picture may have come from Ernest Hemingway’s short story The Killers, which Hopper greatly admired, or from the more philosophical A Clean, Well-Lighted Place. 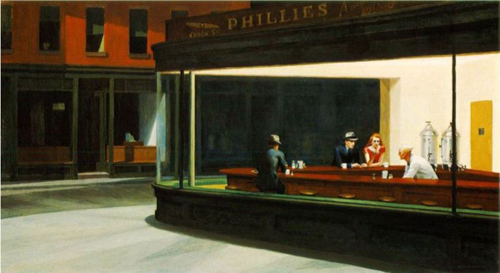 In keeping with the title of his painting, Hopper later said, “Nighthawks” has more to do with the possibility of predators in the night than with loneliness.